As a traveling foodie, I treat every food discovery as memorable because not only to I savor the food, but also the culture and history behind it. But during our recent trip to Siem Reap, I had the most wonderful meal under the trees just outside Neak Pean Temple. I think we just came from our 4th temple and our tuktuk driver just parked outside Neak Pean with instructions that he will wait for us there. Then I espied another tuktuk driver eating some noodles and that's when I saw this lady with her portable noodle store. The lady waved at me (she doesn't speak English) and I asked our tuktuk driver to translate that I'll be back for a bowl after our Neak Pean tour. Here is my bowl of noodles. Actually, most of the lady's customers are tuktuk drivers so I asked if this is a local snack and our driver explained that it is. 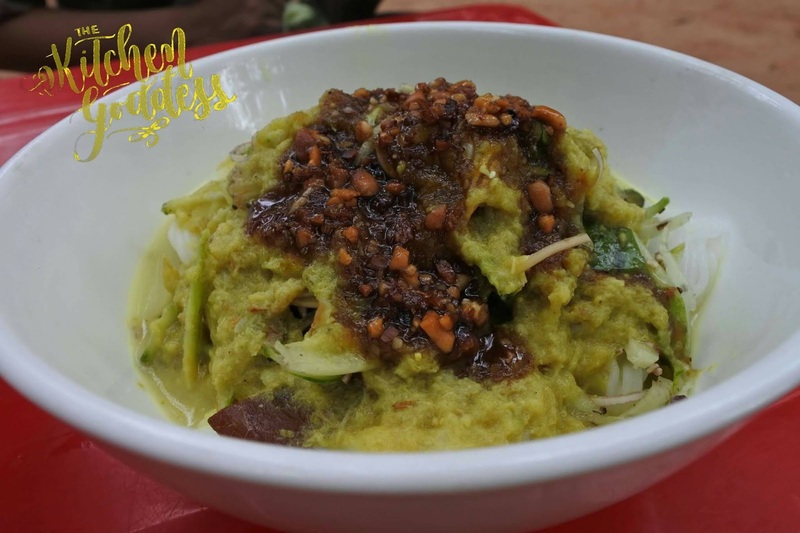 There's white noodles underneath that pile of curry-like paste (not spicy), and some brown salty sauce (I forgot to ask what it is), some julienned cucumbers, and unidentified herbs. This is a vegetarian dish, by the way. I mean, it doesn't have any meat. So how does it taste like? It tastes like a refreshing salad and very light on the tummy. The curry-like sauce gives it some flavor and heightens its refreshing taste. The sauce feels grainy on the tongue but I like its earthiness. 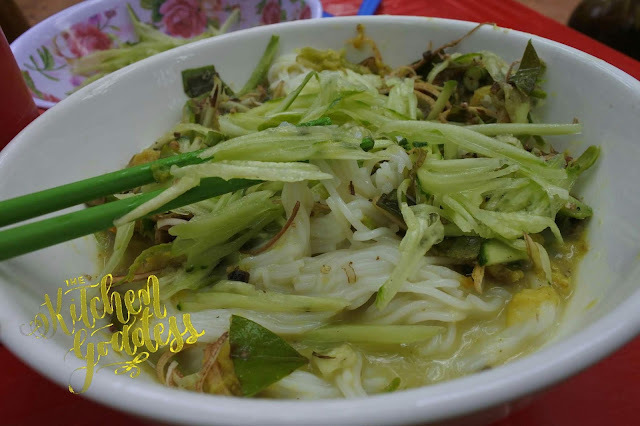 And the lady must've liked me (or maybe she's amused that a foreigner ate her noodles) because she added more cucumbers and leaves. Yes, leaves! 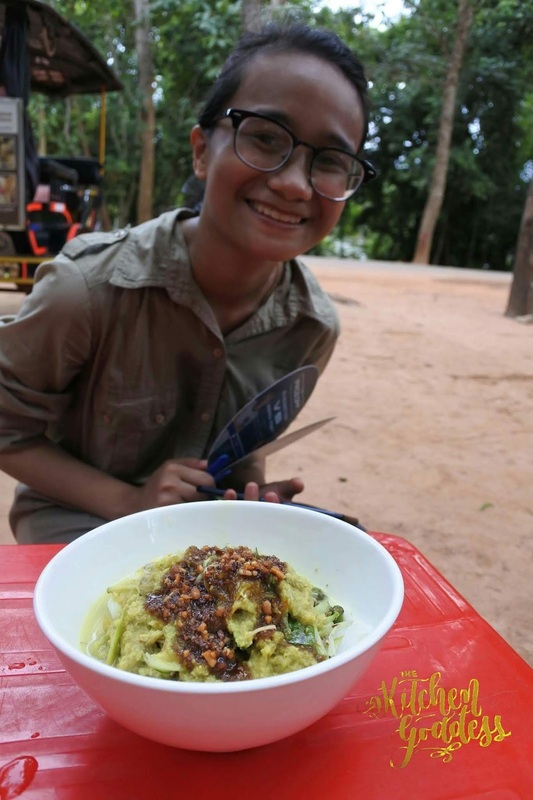 I mean, she plucked some leaves from the nearest tree, shredded it and added it on top of the noodles. Here's my daughter who changed her mind when she saw me happily eating the noodles, and ate half of what I'm eating. I think I paid $1-2 USD for that bowl. Overall, it was a great experience to taste something that only a local would only appreciate. 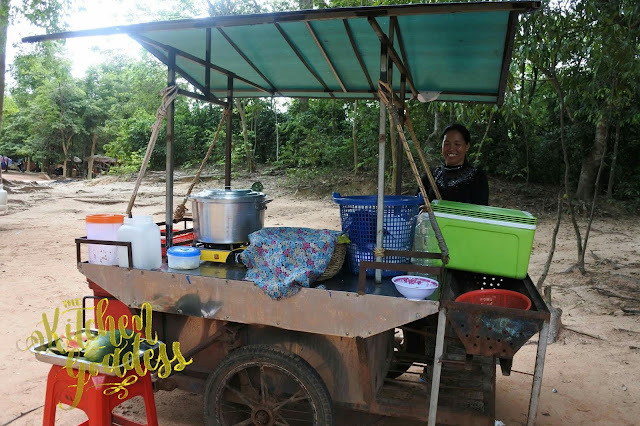 Here's the lady selling this refreshing noodles outside Neak Pean Temple so just in case you happen to visit the temple, do stop by for some noodles.